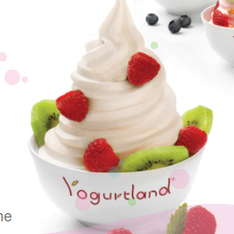 At every yogurtland location you get to make your frozen yogurt the way you want it. The founder of yogurtland opened his first location in Anaheim California where they are now headquartered with a business plan sure to succeed since self serve yogurt shops were relatively non existent when he first opened in 2006 well before Menchies and other small yogurt stores. 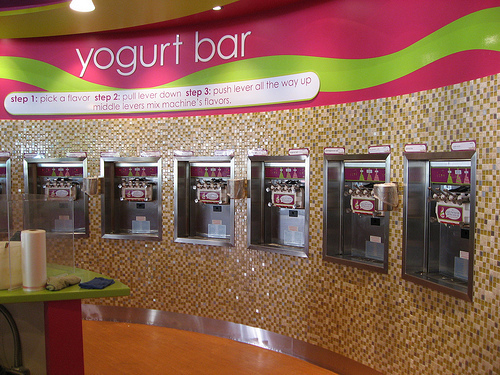 Yogurt land also has more flavor options, 16 at one time at every store, but a few less topping choices than Menchies. Yogurtland has over 135 locations in the U.S(including Hawaii and Alaska), Japan, Guam, and Mexico and plans to continue to grow through franchising and opening corporate owned stores. To franchise a Yogurtland it’s going to cost anywhere from $385,000-$435,000 plus and additional 8% of your stores gross income each month to pay for company marketing and royalties. Wow, that’s expensive! Yogurtland does not outsource for their frozen yogurt. The company continues to make frozen yogurt using their own original recipe. Yogurtland aficionados rave about the double cookies and cream, guava pineapple tart, mango, N.Y. cheesecake, pistachio, and coconut flavors and with so many options offered daily. Here is a link to a PDF of all their different flavors nutrition information. How many grams of sugar in Yogurtland yogurt?